The farm share frequently includes beets which, generally, we don't eat as often as maybe other people do. Or at least as often as the farm share organizers think we should. So I end up with a stockpile that then needs to be canned. I did that this evening. I'm not sure why I always think it won't be a lot of work, because it is. It takes a really long time to prepare all the beets before I can even pickle them. 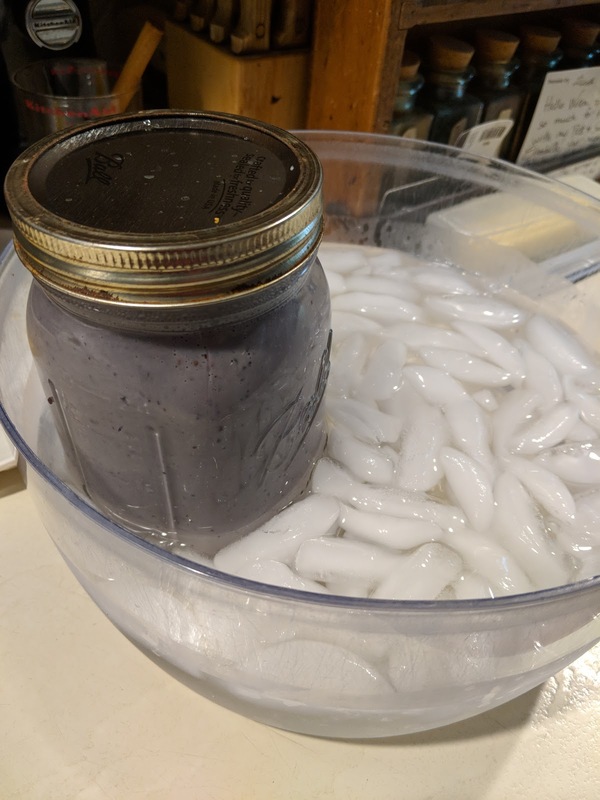 The recipe for pickled beets is the standard one from the Ball Complete Book of Home Preserving, except that I generally double the liquid/sugar proportions. This time, because I had more beets, I tripled the liquid parts. There were some tiny beets in with the rest, I set these aside into two pint jars and these will go to the fair. I know I said I wasn't going to enter any more pickles but I think these will be OK. I was hoping to get into the hives today and change the feeders. However, it's 106˚F and it's after 5 pm. So that's a no. I don't want to take the chance that the combs will fall off the bars if I move them and I don't want to melt into a little puddle inside my bee suit. It's supposed to be cooler tomorrow so I'll try for that. Today I braved the 96˚F heat to pick up the farm share. I did NOT pick flowers today, they were practically already wilting before they were even picked. I did, however, get enough hot peppers that it was time to make a sauce. This is a recipe I've been desperately wanting to enter into the fair. The first hurdle was canning it correctly, using Clear Jel instead of flour as a thickener. I think I managed that today, using up my last 1/2 cup of Clear Jel. It's thick enough, I believe. The other hurdle has been figuring out what category this fits in. After spending a little time pondering the situation, the only category that works is "Chutney." Technically, a chutney is: "a spicy condiment made of fruits or vegetables with vinegar, spices, and sugar, originating in India." Is this a condiment? Yes. Is it spicy? Yes. Is it made of vegetables with vinegar, sugar and spices? Yes (if you include the spices in the mustard, or the mustard itself). Therefore, I think it qualifies. Hopefully the judges agree. This one is very, very spicy. Not inedible, but HOT. Whisk the ClearJel and water into a slurry and set aside. Cut the stem ends off the peppers and grind them in a blender, seeds and all, with the vinegar until mostly smooth. Boil the peppers, vinegar, mustard, sugar and salt. Drizzle in the ClearJel slurry and cook for 5 minutes. Ladle into jars leaving a ½ inch headspace. Process in a boiling water canner for 20 minutes. Makes about 10 cups. For my birthday I put together a variation on a few cakes from school. 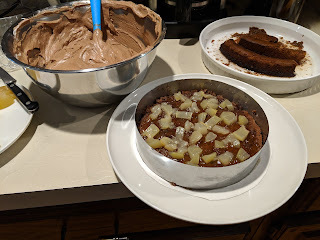 I had a chocolate almond genoise layer in the freezer so brought that out and soaked it in pear syrup from a jar of canned pears I'd made last summer. 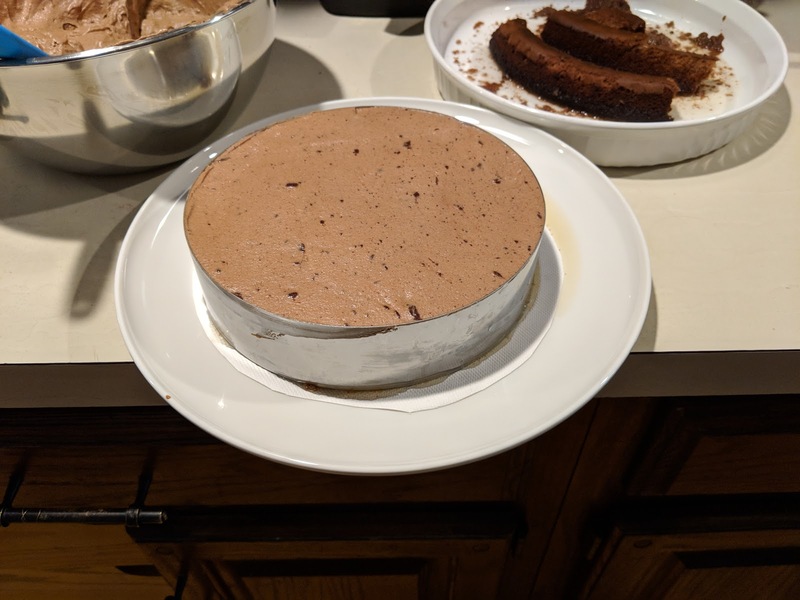 Then I made chocolate mousse. 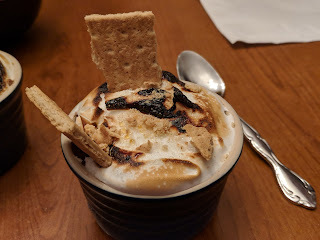 Since I had a fair amount of chocolate mousse and meringue left over, I made little pots of mousse which, when toasted and with the addition of graham crackers, made nice little s'mores themed desserts for the next night. Yum! After a series of weekends when it wasn't possible to get into the hives, I went out this morning and to check on things. I felt it was time to start feeding them and so I got syrup ready and took a look. Hive #1 was slightly aggressive, I didn't see Beeyonce but I did see larvae and capped brood. Hive #2 was not aggressive at all. I saw Phoebee, who seemed fine. I saw some larvae and some capped brood. Here's what I didn't see: any honey whatsoever. In either hive. Granted, that's not too surprising, given that it's August and this is when there is a dearth of nectar. The fact that the bees were relatively polite was a good sign that they're doing OK, but they needed food. It's a good thing I planned to start feeding them; I'll have to keep at it until October. Hopefully the Autumn nectar flows will help. And this year I'll have to make fondant for them. Given that, I have no expectations of getting any honey next spring, at least, not until they're really producing for themselves. Whenever we hear the adjective "baby" applied to anything like carrots, or other foods, or woolen things, we have to suppress a giggle or two. You see, almost 20 years ago we were in Peru for a long trip. During that time, vendors would always try to entice us to buy things. They would say, "Alpaca...baby alpaca," hoping we would be fooled into buying their machine-made woven or knitted goods which didn't have much or any alpaca wool in them, baby or otherwise. We learned quickly to identify the quality goods from the rest and did come back with many nice things (see photo, hands down the nicest hand woven blanket we saw), but navigating the street vendors was always a challenge. It did get easier as our Spanish got better although nothing could mask our appearance as tourists. You can understand why labeling something as "baby" automatically raises a red flag for us. Baby carrots in the grocery store are, for the most part, not young carrots at all but larger carrots cut to look small. 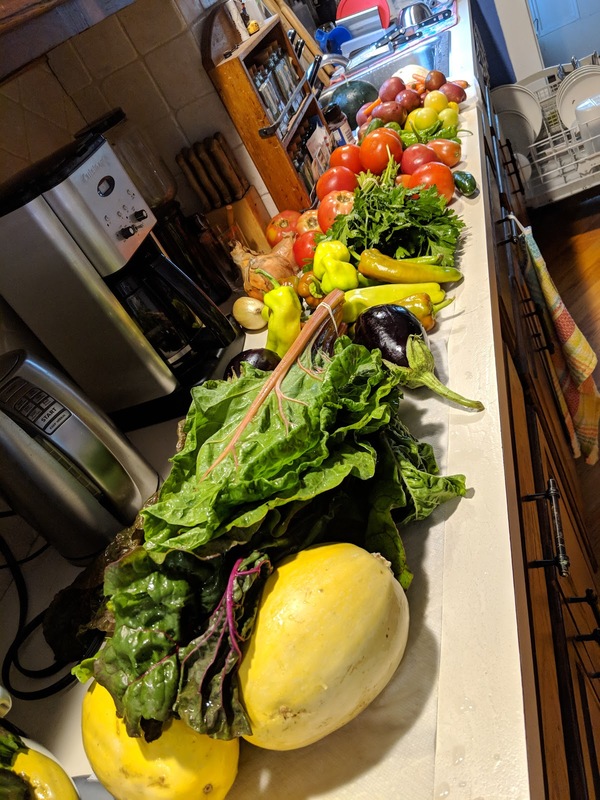 Not so with the farm share! 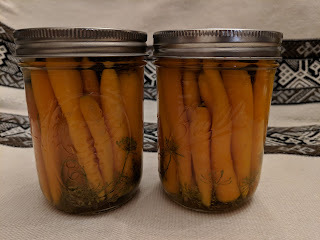 Tuesday's pick up included two pounds of carrots and I made a point of finding the smallest ones I could get out of the bin. When each carrot weighs maybe half an ounce it took a while. Today I set about making pickled carrots (Ball Complete Book of Home Preserving, page 312) and I peeled each and every one of those little carrots. I even left their little stem end on, so they look like the ones you sometimes get in fancy restaurants. These are truly baby carrots and they make me happy just to look at them! I plan to enter them in the fair, and it's cutting it pretty close in terms of them have enough time in the vinegar brine to be fully pickled by the time the judges taste them. This is certainly the last pickle I'll be able to enter this year. One of the tasks this week was to make salsa verde with all the tomatillos from the farm. I decided to make it a little spicier than usual, as I have a lot of hot peppers. For one pound of tomatillos I added 5 serranos and/or jalapeños. They get all jumbled up in my bag of things from the farm and I have trouble telling them apart. Therefore, I use them interchangeably. This batch is definitely spicier! And they're going to the fair. It's... overwhelming. You can't even really see the 3 melons and pint of cherry tomatoes in the sink! Just now, after a day spent in an escape room, having lunch in Boston, avoiding thunderstorms, and napping, I made Caramel Pear Jam. I had guessed correctly that the remaining pears from my friend worked out to be four cups of purée but I did have to run quickly to the store for brown sugar since I didn't have enough. It tastes like a pear version of applesauce and it's lovely. This is another entry for the fair, I think! My friend and neighbor with the pear tree emailed me a few days ago, saying the tree had about a million pears and did I want some? Well, she wasn't kidding. That tree really did have about a million pears. It's still relatively early in the season but they'd already started to fall and mess up her yard. I grabbed about 20 pears and left them in my kitchen to ripen for a few days. One of the things that has been making me a little nervous is that the fair is fast approaching and I didn't have much to enter yet. I decided to revisit a recipe I made pretty early on in my canning hobby, a pear ginger conserve that has chopped almonds in it as well. It's in the Ball Complete Book of Home Preserving, page 90. Right around the time I was grating the ginger, the pages fell open to another recipe that uses fresh ginger but calls for a cup instead of a teaspoon! I'm glad I caught my error in time. 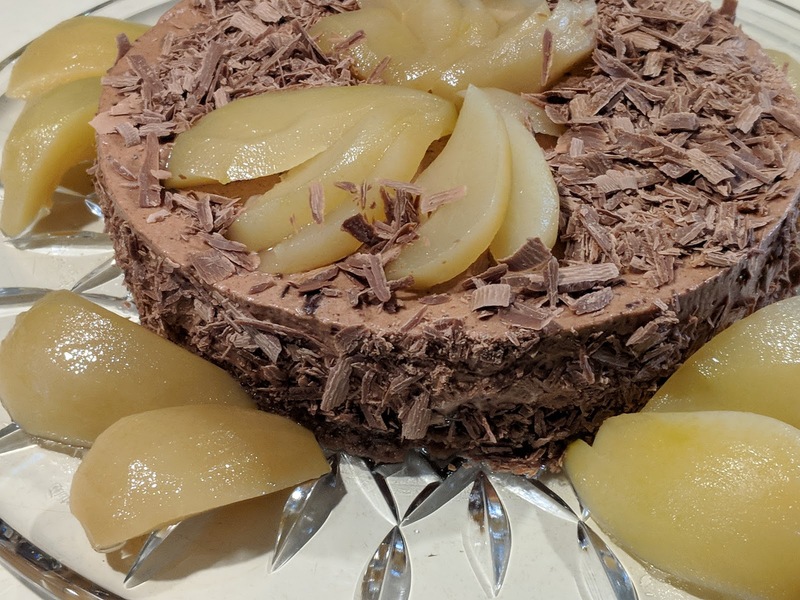 This used a little less than half of the pears, and I have plans to make another recipe with them tomorrow. Or maybe in a day or two. Our original plans for tomorrow have pretty much evaporated due to impending thunderstorms so we're going to do one of those escape rooms instead. Wish us luck! Today the elderchild and I put together the blueberry ice cream. First we made the base: I puréed a cup of berries and topped off the volume with milk to get 16 ounces. To this we added 6 ounces cream, 8 egg yolks and 5 ounces of sugar to make a creme anglaise. It was a nice purple color. It rested in the fridge until later in the afternoon when we ran it through the ice cream maker, adding the half-cup of frozen blueberries I'd set aside yesterday. This then waited in the freezer until it set and it was time to have dessert! 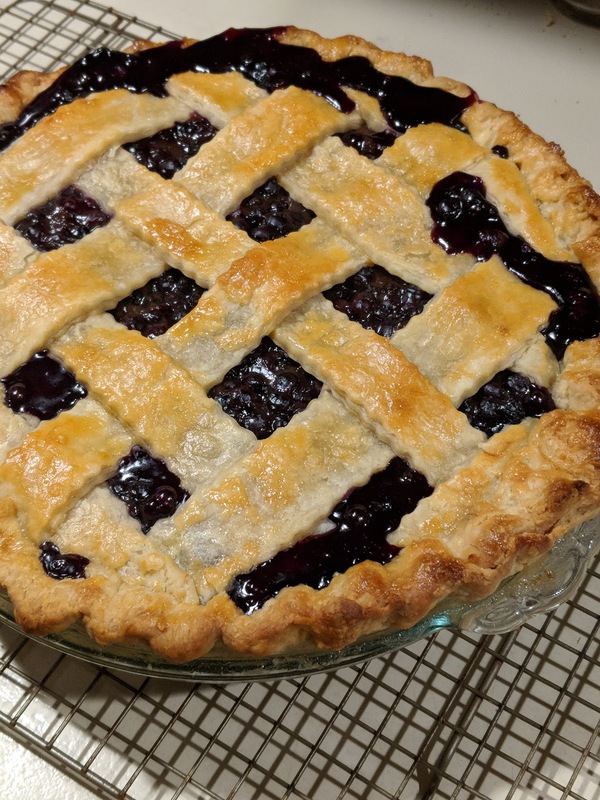 I'm very pleased with how the pie filling worked this time - it wasn't runny and since these were fresh wild berries they held their shape well. It didn't look as though the filling was jam which is how I think store bought blueberry pies often look, due to being made from frozen berries. As early as we could manage, the elderchild and I went to pick wild blueberries. I'd purchased a new toy in the hopes that it would go faster: a blueberry rake. 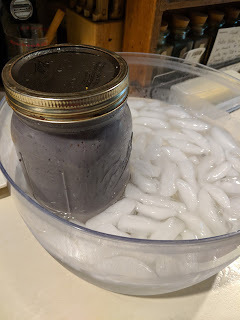 It was also going to be 100˚F today so we left the house at 6 am and were done picking a half-gallon of blueberries by 8:30 am. It was already 90˚F when we left! Anyway, the rake worked fairly well when the bushes were almost completely ripe. If they weren't, the rake would pull off the unripe berries as well, so I resorted to hand-picking when I came across a bush that was not entirely ripe. It did well even though wild blueberries are smaller. I'd been worried it would miss a bunch of berries or they'd fall out after but it seemed to work just fine. 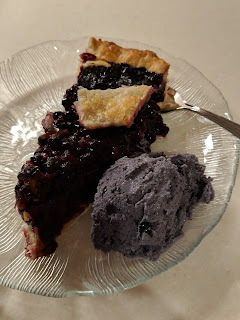 Over the course of the day, the elderchild and I made a pie out of most of the berries (6 cups worth) and I set aside some to make blueberry ice cream tomorrow. The pie is for dessert tomorrow with the ice cream. Mmm. For the filling, instead of tapioca I made a base of cornstarch, water, sugar and spices and then poured it over the berries. This seems to have worked much better than the tapioca; my main complaint had been that you could still see the little pearls with the tapioca. This crust is half butter and half shortening as I wanted to see what it does for the texture. 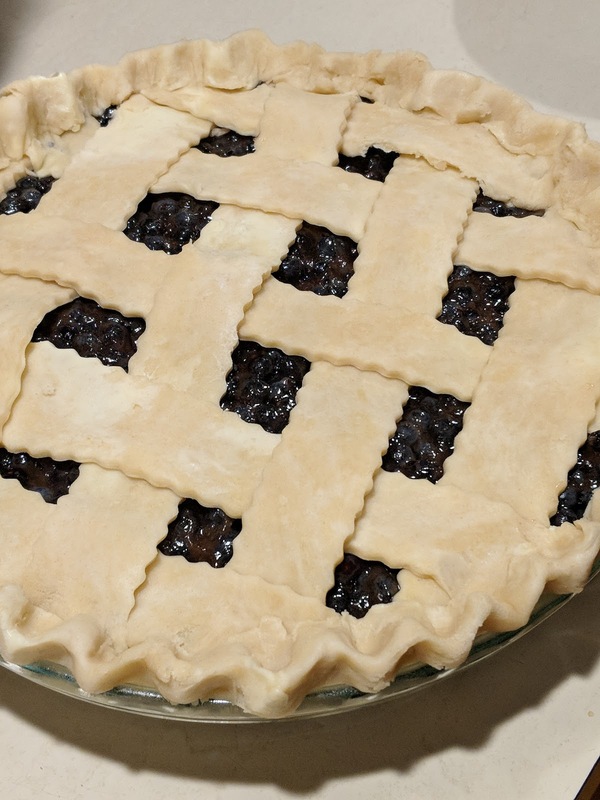 I taught the elderchild how to make a proper lattice, and now the pie is cooling and smelling wonderful!